MOSCOW, Russia (CNN) -- Russian energy monopoly Gazprom said Thursday it has cut off supplies of natural gas to Ukraine after a payment deadline expired. A gas-compressor and gas-holder station in Mryn, Ukraine. Gazprom said it had cut supplies to Ukraine Thursday. Gazprom had been threatening the move, saying months of negotiations with Ukraine had failed to resolve the issue of outstanding payments. 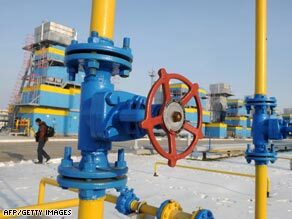 The company says Ukraine owes about $2 billion for past natural gas deliveries. Ukraine also disputes the new price set by Gazprom for 2009 deliveries, which was initially more than double the price from 2008. Gazprom has reassured the rest of Europe that its natural gas supply, which runs through Ukraine, will not be affected by the dispute with Kiev. Thursday, a Gazprom spokesman said on Russian state television the company had actually increased the deliveries to the rest of the continent. "Gazprom will continue supplying gas for its consumers in Europe at full volume," the company's chief executive, Alexey Miller, said. "We have an effective transit contract." Ukraine's state-controlled energy company, Naftogaz Ukrainy, said Thursday it is ensuring domestic natural gas needs are covered by taking gas from underground storage facilities. "All of Ukraine's consumers are fully secured," the company said in a statement. In Washington, the White House urged a resolution Thursday. "The United States would like to see a restoration of normal deliveries," White House spokesman Gordon Johndroe said. "The parties should be resolving their differences through good-faith negotiations, without supply cutoffs." The frigid weather is of particular concern, the White House said. "We urge both sides to keep in mind the humanitarian implications of any interruption of gas supply in the winter," Johndroe said. Naftogaz Ukrainy also disputed Gazprom's claim that it owes for past deliveries, saying Thursday it has paid its debt to Gazprom in full, though it declined to give a figure. Another part of the dispute centers on Gazprom's price hike for 2009 gas deliveries. Gazprom had wanted to more than double Ukraine's payments, but Wednesday it offered a lower price. Ukraine, which currently pays about $100 per 1,000 cubic meters, balked at the figure offered, saying it simply can't afford to pay the new price. It is the second time in three years Gazprom has threatened to cut off gas supplies to Ukraine. The company made good on its threat on January 1, 2006, but turned the supply back on a day later. Naftogaz said in its statement Thursday that it would ensure the uninterrupted flow of Russian gas to Europe through Ukraine, but only under existing arrangements. It indicated some gas deliveries to Europe could be halted in Ukraine if Naftogaz fails to reach a new agreement with Gazprom. Although gas is still flowing to Europe, there are also concerns in Russia that the amount could be reduced if Ukraine siphons off some of the gas headed to the west. Naftogaz said it will continue negotiating with Gazprom to address the issues.